Sparkle, shine and glitter. This cannot be missing in a highlighting makeup. The well-known tattoo artist from LA – Kat Von D also remembered about this rule. 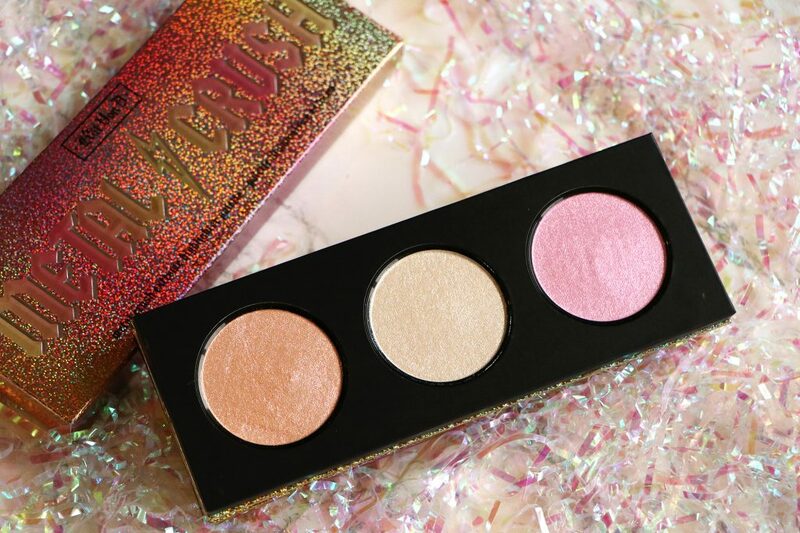 She has created a highlighting palette Metal Crush Extreme. Will you become a fan of such dazzling look? It is a rather small cosmetic with an elongated shape and three highlighters inside: Gammaray, Helix and Rosehock. The round products with high glitter content and rather poorly pigmented. If we look closely, we will see that cosmetics have candy and powdery shades. The lid looks pretty similar as well as the swatches on the skin. Unfortunately, there is no applicator in the packaging; instead, the manufacturer has placed a mirror. When it comes to the use of Kat Von D’s highlighters, you must be very careful. If you apply too much product, you might end up with a comic effect and cover your face with half the glitter. It is best to apply a minimal amount of the cosmetic just to highlight the parts of your face you wish to emphasize. The products can also replace eyeshadows! If applied correctly, they will give a natural effect of a radiant look and help you contour the face. Metal Crush Extreme by Kat Von D is also a product suitable for vegans and people with sensitive skin as it does not contain any irritating substances. How to apply Kat Von D highlighter? Use a soft and wide brush and scoop a very little amount of the cosmetic. Transfer it to the cheekbones, the ridge of the nose, the tip of the chin, and temples. right after the first application, you will notice a slight highlight. If you feel the need, add another thin layer. But remember: the more glitter on the face, the less natural the effect. Thanks to Metal Crush Extreme you can also create a nice eye makeup or just add a shimmery touch to the matte eyeshadows. The incredible effect will exceed your expectations.